unstoppable national momentum for a 100% clean energy future for all. DUNEDIN, FL -- Last Thursday, December 6, 2018, the Dunedin City Commission unanimously approved a resolution establishing a goal of powering municipal operations entirely with renewable sources of energy by 2035, and community-wide by 2050. This action establishes Dunedin as the 101st city in the nation to commit to 100 percent clean, renewable energy. Additionally, 26 local businesses and organizations signed a letter of support for Dunedin’s goal. Dunedin joins five other cities in Florida -- Largo and St. Petersburg also in Pinellas County, as well as Orlando, Gainesville, and Sarasota -- in establishing a goal of being powered by 100 percent renewable sources. Four cities in Florida served by Duke Energy have now committed to 100 percent clean energy. Dunedin is known for its world-class beaches -- Honeymoon Island and Caladesi Island State Parks, walkability, and lively celebrations of its proud Scottish heritage. A coastal city, Dunedin is especially vulnerable to effects of climate change like sea level rise and destructive storms. As recent studies like the Fourth National Climate Assessment and International Panel on Climate Change report show, climate change is a major threat to communities -- and a transition away from polluting dirty fuels to renewables is imperative to avoid the worst effects of climate disruption. By committing to 100 percent renewable energy, Dunedin joins other Florida cities in taking climate action by moving toward a stronger, more resilient energy system for everyone. “The City couldn’t be more excited to take this next step in making the world a better place. We signed on to the Mayors for 100% Clean Energy and now we are taking our commitment to the next level. Our Commission and our Citizen Committee on Environmental Quality believes strongly in setting the example for our residents future,” said Dunedin Mayor Julie Ward Bujalski. “Congratulations to Dunedin for joining the movement towards 100 percent clean energy. There’s strength in numbers -- and by working together to change our shared energy system, more Pinellas County residents will enjoy the benefits of healthy and affordable energy,” said St. Petersburg Mayor Rick Kriseman. “Lately we’ve heard a lot about the risks and dangers posed by climate change. Today, Dunedin's leadership is telling a new story -- one of optimism and opportunity. Communities who step up to build a clean energy future today will have a competitive economic edge tomorrow. This commitment, combined with those of St. Petersburg and Largo, means that approximately 40 percent of residents in Pinellas County -- Florida's most densely populated county -- live in a place committed to 100 percent clean energy. We're approaching a very positive tipping point,” said James Scott, Executive Committee Chair of the Sierra Club Suncoast Group. support from Diane, chair of the City's Planning Board. What you can do right now to grow a clean energy future: The Ready for 100 national team has created a new tool kit to help you and your community join in the celebration of this collective accomplishment -- and we need your help! This moment can also help support your campaign's advocacy for 100% clean energy locally. Please share this tool kit with your local volunteers and allies and help spread the good news via letters to the editor, op-eds and social media. As this kit was released in recognition of Cincinnati's 100th commitment the night before Dunedin's, please add a note that America is rapidly moving past Cincinnati's 100th commitment into our 2nd set of 100 cities. We'd love for cities numbered 1-- to include your Florida cities or counties. Spreading the news that this is happening will get lots of folks intrigued and dreaming over the holidays, not just of a white Christmas, but of a clean energy future where we still have snow somewhere! I went to bed Tuesday night in a funk after election results showed that Andrew Gillum, Bill Nelson, and Nikki Fried each would lose their contests by about 1 percentage point despite leading in most major polls. I had hoped that wins by Gillum for Governor and Fried for Commissioner of Agriculture could reverse the damage done to Florida’s environment by eight years of negligence by Rick Scott and Adam Putnam, and that Nelson's re-election to the Senate would solidify the anti-Trump wave expected to overtake Congress. Hope disappeared for the night, replaced by memories of past Florida election nightmares. My guess is that many of you felt the same way. Two years ago, my election night depression lingered on for days. I should have been celebrating the voters' rejection of a constitutional amendment promoted by Florida's monopoly power companies that would have made it difficult for homeowners to put solar panels on their roofs. Instead, I woke up gripped by fear on where our country was heading after electing Donald Trump. I feel differently today despite frustration over the current election outcome. I no longer live in fear of the hate, greed, discrimination, and divisiveness Trump has unleashed on Florida, America and the world. That's because there are millions of people who are resisting Trump’s platform and creeping fascism with a solidarity that makes me and everyone I know more determined and courageous. The resistance is strong in Florida and is turning into a movement that will not only protect our air, water, and natural environment again, but also transform the Sunshine State into a place that is just, inclusive, and equitable. My mood has improved each day this week following election night. One reason is obvious; results for the three races at the top of the ticket have tightened considerably, giving hope that one or more of our environmental champions could win. Tens of thousands of uncounted ballots are being tabulated in South Florida, and those votes are heavily favoring Nikki Fried, Bill Nelson, and Andrew Gillum. Fried has jumped out to a 3,000 vote lead over Caldwell. Nelson is now just 0.18 percentage points behind Scott and closing fast as more ballots are counted. Gillum is less than a half point behind DeSantis and gaining ground. There will be recounts in all three elections accompanied by nasty attempts to shut them down. Rick Scott made that clear last night. "No ragtime (sic) group of liberal activists or lawyers from DC will be allowed to steal this election from the voters in this great state," Scott said. Those words don't sound appropriate for a man who is going to join two other Cabinet members to certify Florida's final election results. He just put me in a fighting mood and, frankly it feels good. My response to Red Tide Rick is that I and other "ragtime" Florida activists, are not going to let you steal the election by using the power of the State to stop counting the vote in Florida. We've seen that trick before and we're not going to let you do it again. First-time candidates Debbie Mucarsel-Powell and Donna Shalala won congressional seats in Miami-Dade County joining the blue wave that swept Democrats to a majority of the US House of Representatives. Sierra Club endorsed candidates for Congress who won re-election and joined the new pro-environment majority include Al Lawson, Stephanie Murphy, Darren Soto, Val Demmings, Charlie Crist, Kathy Castor, Alcee Hastings, Ted Deutch, Lois Frankel, Debbie Wasserman Schultz, and Frederica Wilson. Amendment 4 passed – restoring rights of felons, except for those convicted of murder or sexual crimes. 1.4 million former felons who have been cruelly disenfranchised despite serving their time will now get a chance to register to vote and regain their rights as citizens. Amendment 9 passed - prohibiting oil and gas drilling in Florida’s state waters as a permanent protection in Florida’s constitution. Amendment 1 was defeated with our help, ensuring that our counties and cities will continue to have the fiscal resources to provide community services and preserve environmentally sensitive areas. Two strong environmentalist supporters, Mariella Smith and Kimberly Overman, were elected to the Hillsborough County Commission, switching it to a 4-3 pro-environment majority. Hillsborough County also passed an “All for Transportation” sales tax that will fund a robust transit system for Tampa and its suburbs. Gainesville voters rejected by an overwhelming margin an attempt to take control of the Gainesville Regional Utility away from the public. That preserves the City’s ability to move forward with its commitment to 100% clean, renewable energy that it adopted just three weeks ago. In Sarasota, voters changed the way they elected the Board of County Commission to single districts which should help elect environmentally inclined candidates to the Commission in the future. Several Sierra Club endorsed candidates won election, including Ben Diamond, Jennifer Webb, Fentrice Diskell, and Margaret Good in the Florida House, and Annette Taddeo in the Senate. They will be outstanding environmental champions in the Florida Legislature. Additionally, Jim Bonfiglio, our endorsed candidate for State House District 89, emerged from the election in a too-close-to-call race that will head to a recount. Webb became the first married lesbian elected to higher office in Florida's history. We had endorsed her in 2016 too. She lost on her first try but never left the picture, essentially running for two more years to achieve an important victory. There were many good candidates we supported who lost their first time out in 2018, and we encourage them to follow Webb’s example by trying again in 2020. My optimism grows further when I take a look at a map of where Florida’s statewide candidates prevailed and contemplate how we can learn from it to create a green wave that encompasses the entire State in the years to come. Gillum, Fried and Nelson won a majority of the votes in most of the state’s urban areas including Miami-Dade County, Broward County, Palm Beach County, Orlando, Tampa, St. Petersburg, Jacksonville, Gainesville, and Tallahassee. DeSantis and Scott won the Florida panhandle, southwest Florida from Sarasota to Naples, and the rural counties. That’s a roadmap telling us which cities and counties are likely to pass stronger environmental rules, and it also reveals the places where we need to educate people about the threats to our air, water, land, wildlife and climate facing Florida’s communities. Looking at that map, we’re at a great starting place to create a green wave that sweeps over blue and red areas of the state alike. What inspired me the most this election? It’s looking back at the way Andrew Gillum galvanized voters. He built a remarkable coalition that included more people of color, more voters under 30, more women, and more environmental supporters than I’ve ever seen joined together on a common cause in Florida. That stellar organizing accomplishment brought him closer to winning the Governor’s race than any Democrat since Lawton Chiles defeated Jeb Bush in 1994. Andrew Gillum is a gifted leader who rose above the racism stirred up by Trump and DeSantis and he defeated it, no matter the final outcome when all the votes are counted. We need to continue working with him to build a better Florida. "I don't want to be an alarmist"
Election Day is TODAY and there is a lot at stake. This is our chance to weigh in on the issues that matter most to us; to take a stand for our planet, our livelihoods, and our democracy. Don’t sit this one out. 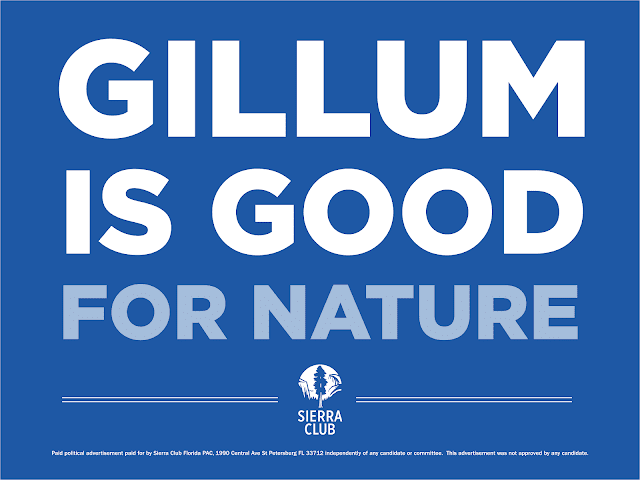 Our climate, water, land, air, and wildlife need a governor like Andrew Gillum. Join us in casting a ballot before 7 PM! Paid political advertisement paid for by Sierra Club Florida PAC, 1990 Central Ave, St. Petersburg, FL 33712 independently of any candidate. No candidate has approved this advertisement. 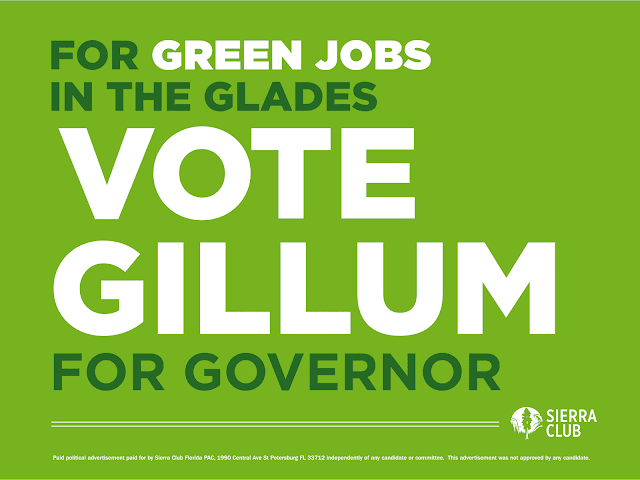 Ready to vote for Gillum for Governor tomorrow? Election Day is tomorrow and there is a lot at stake. Don’t sit this one out. Our climate, water, land, air, and wildlife need a governor like Andrew Gillum. Join us in casting a ballot Tuesday! Take this opportunity to put an environmentalist in the governor’s office. What a concept! We cannot afford to lose this one. Gillum’s opponent, Ron DeSantis, is a Donald Trump wannabe, and the last thing we need is Trump double in Tallahassee! Make sure you know where to go by clicking here to go to the Voter Information Lookup page from the Florida Division of Elections. Polls are open on Election Day from 7 AM to 7 PM. Click here to see the forms of photo ID to cast a ballot on Election Day. If you forget your ID on Election Day, you can still cast a provisional ballot that will be counted once your identity and registration are confirmed. The leaders we elect make decisions that affect our everyday lives and our future - environment, jobs, health, energy costs, and much more. Join your friends and neighbors and make it count before 7 pm Tuesday, November 6! Trump IS on the ballot! / Trump ESTÁ en la votación! The Republican running for Governor, Ron DeSantis, stands with Donald Trump. Says the dead in Puerto Rico from Hurricane Irma are made up. Denies that climate change is real. Allows the worst polluters to continue to ruin our state waters. And disrespects and endangers us all with his racist rhetoric. Andrew Gillum will stand up to Trump. 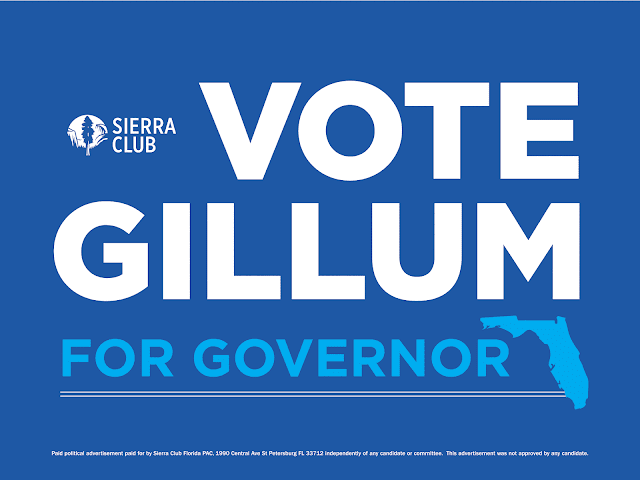 Vote for Andrew Gillum today. El candidato republicano por gobernador apoya Donald Trump. Y nos pone en peligro con su retórica racista. Andrew Gillum le va hacer frente a Trump. Vote por Andrew Gillum para gobernador hoy. Paid political advertisement paid for by Sierra Club Florida PAC, 1990 Central Ave, St Petersburg, FL 33712 independently of any candidate. No candidate has approved this advertisement. Anuncio político pagado por el Sierra Club Florida PAC, 1990 Central Avenue, St. Petersburg, Florida 33712 independiente de cualquier candidato. No candidato ha aprobado este anuncio. Residents living within and around the Everglades Agricultural Area have their health, property, and quality of life threatened by the toxic smoke and ash fall, or “black snow,” produced by the yearly, 6-8 month long, pre-harvest sugarcane field burning season. 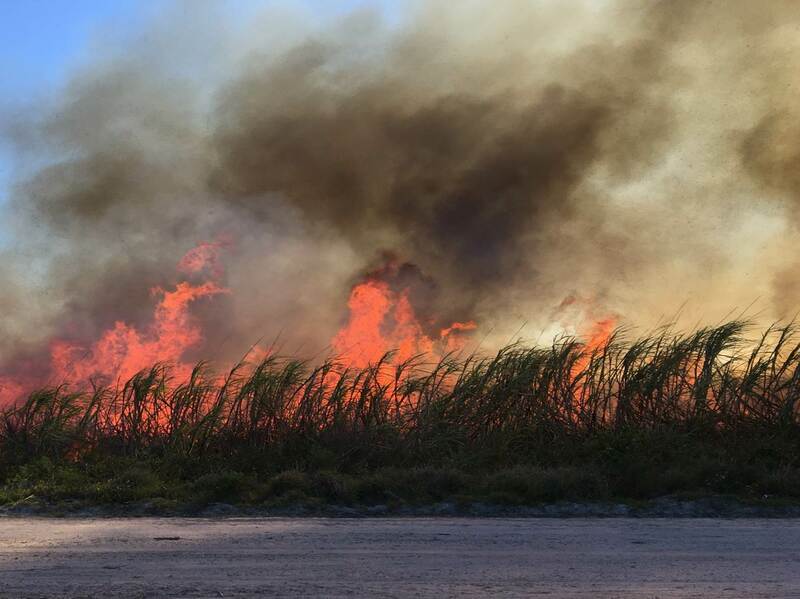 Gillum/King have condemned the current discriminatory burn permit regulations that prohibit burning when the wind blows toward residents on the east side of Palm Beach County but encourage burning when the wind blows toward Pahokee, Belle Glade, and South Bay. Gillum/King advocate for the alternative to burning called “green harvesting.” Green harvesting is being practiced by other sugarcane growing nations around the world as the healthy, sustainable, and economically viable alternative to sugarcane burning. 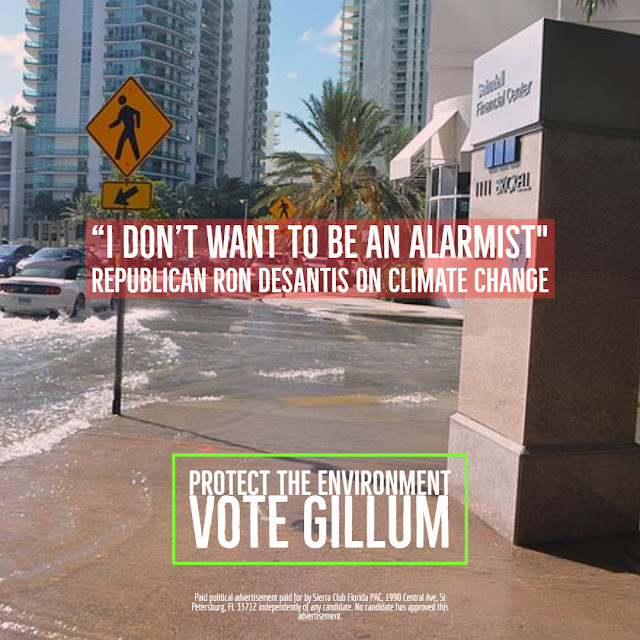 Andrew Gillum’s opponent, Ron DeSantis, has a well-known polluter-friendly, EPA-gutting voting record in Congress. (2) those of us who are spared the black snow but know that an injury to one is an injury to all. In Florida, Republicans have held the Governor’s office and both chambers of the Legislature for over 20 years and there is little tension between them. One-party government breeds contempt for the opposition and for the voters who support them. Ultimately, it is anti-democratic. Maintaining power becomes more important than making tough decisions, especially decisions that would discommode powerful interests. It’s time to stop this in Florida. Our system of government relies on separation of powers to keep it from going off the rails. For separation of powers to work, each branch must have some power. Give Andrew Gillum that power – the power to appoint, the power to propose a budget to achieve his priorities, the power to issue executive orders, and the power to veto legislation. A Governor Gillum will wield a power not written down in any Constitution: the power to bargain. He will be able to play hardball with the Legislature and extract a quid pro quo to achieve the most important of his goals. It’s about time we had someone on our side in Tallahassee. There is zero reason to trust DeSantis’ promises regarding what he would do if elected governor. Promises do not an environmentalist make! Why vote FOR Andrew Gillum? You don’t have to count on promises with Gillum and you don’t have to ignore his past record. GILLUM IS GOOD FOR NATURE. Vote for Andrew Gillum for Governor! 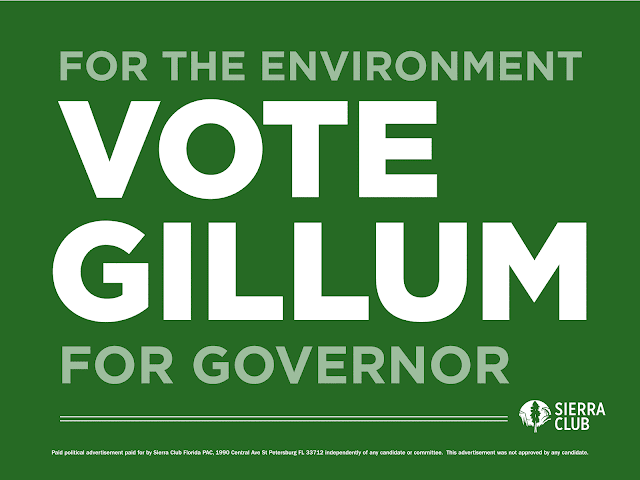 Let’s get Gillum to Victory! We have four days until Election Day, and there is so much you can do to win the day for Andrew Gillum. You can let your fingers do the clicking, pick up your phone, or you can hit the streets! First, use these graphics to show your support on social media print out your own posters. Be creative and have fun -- you could gather some friends and wave posters on your favorite busy street corner (but be safe) or hang a poster in your car window or front porch! Snap a selfie of you with your sign and post on your favorite social media site. Want to do more (or something different)? Be a volunteer hero with the Win Justice Campaign (a collaboration of Organize Florida, SEIU, Planned Parenthood, New Florida Majority, Florida Immigrant Coalition, and more.) They are joining Sierra Club in the fight to elect an environmentalist governor. Opportunities include making calls, knocking on doors, and giving rides to the polls Click here to volunteer with the Win Justice Campaign. And don’t forget to call your friends and family to remind them how important it is to vote and to make sure everyone can get to the polls. You can do this. We can do this if we all pull together. If we don’t get the vote out, the attacks on our water, air, land, and wildlife will keep coming from the governor’s office. If we make the effort, we will win! St. Petersburg, FL – Rick Scott held a news conference today to announce the completion of the second phase of the Tamiami Trail bridging project. 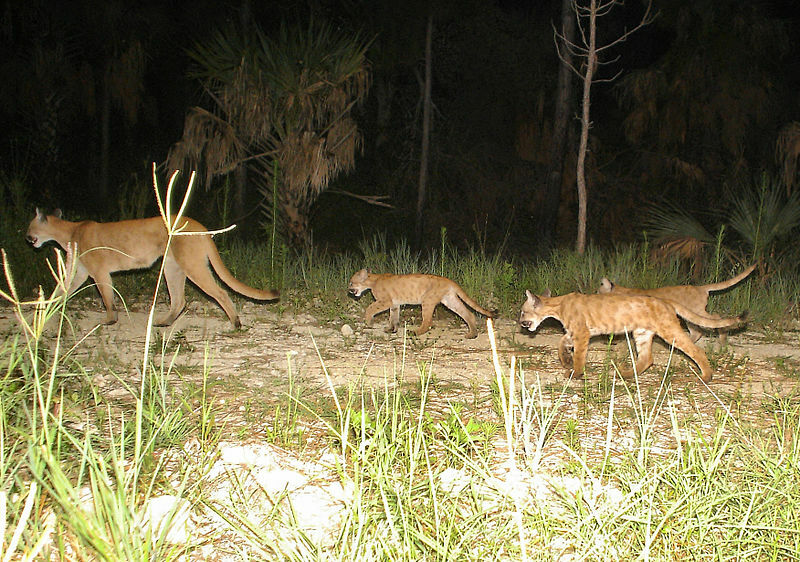 “Governor Rick Scott held a self-serving, restricted attendance media event just one week before Election Day that was disguised as a major Everglades announcement. It’s political pandering at its worst designed to benefit his election campaign against US Senator Bill Nelson. “What was the rush? Scott’s advisory was released less than three hours before the Miami press conference. “Instead of using the media event to celebrate a shared federal-state success on the Tamiami Trail bridging, Scott used it to attack Congress for not spending more money on Everglades projects. Could he get more political? “And the map that was linked in his ‘announcement’ is obvious electioneering. Rick Scott is not the champion of 42 projects, many of which were begun way before he was first elected Governor. “Environmental organizations including the Sierra Club, the National Parks Conservation Association, Audubon Florida, Center for Biological Diversity, Sanibel Captiva Conservation Foundation, the Conservancy of SW Florida, Florida Oceanographic Society, and other members of the Everglades Coalition that advocated for the project and provided input on the Tamiami Trail bridging project to the US Army Corps of Engineers and the National Park Service for more than a decade weren’t invited to attend. We learned about it from photos of the event posted this morning by Lieutenant Governor Carlos-Lopez Cantera. 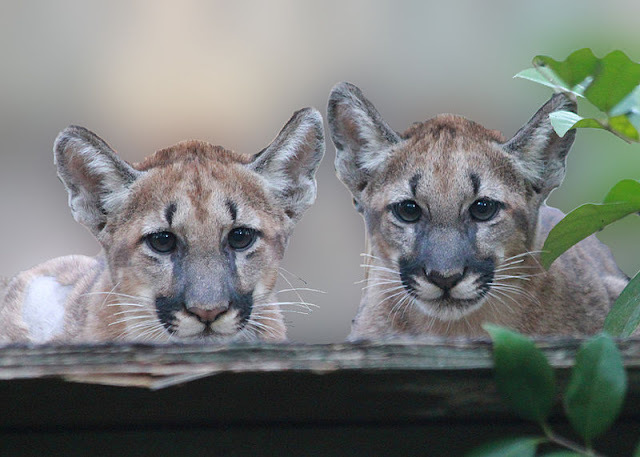 “A great many people worked on building those bridges from the time the Sierra Club placed it on the public agenda as the “Everglades Skyway.” For the Governor to slight the very groups that brought us to this day is an insult and a rewriting of history to serve his political ends. Did he fear that Everglades supporters would show up holding Red Tide Rick protest signs? “Scott is desperately trying to whitewash his environmental record as he tries to unseat Senator Bill Nelson in the current election. As Florida’s Governor, Scott gutted enforcement of clean water rules in Florida instead of stopping the pollution that fueled Florida’s toxic algae and red tide crisis. He spent eight years blocking efforts to clean the very water that would go under the Tamiami Trail bridges and installing water managers to do Big Sugar’s bidding. “Scott scuttled growth management in Florida and replaced it with plans for new sprawling cities that would eliminate much of Florida’s rural farmland, bulldoze over wildlife habitat, and threaten the State’s depleted water supply. For eight years as governor, he stood idly by, denying climate change and abrogating his responsibility to work with state, national, and world leaders to stop the carbon pollution that is bringing rising seas and ever-stronger hurricanes to Florida and is threatening the very existence of the Everglades. “Scott sabotaged our best chance of restoring the Everglades and protecting the St. Lucie and Caloosahatchee river estuaries when he publicly rejected Governor Charlie Crist’s historic contract to acquire 187,000 acres of sugar land that would allow us to move excess Lake Okeechobee water south to the Everglades. In its place, he and his water managers have designed a risky, 23 foot deep reservoir on a tiny footprint that is missing the wetlands needed to clean the contaminated water from Lake Okeechobee that the reservoir will hold.